When Murtuz Sadikhli (1929-1997) was eight years old, his family was rounded up from their village of Nakhchivan and shipped out in cattle cars to Kazakhstan. It was a tortuous journey that took 39 days. That was the dreadful year of 1937. During Stalin's rule (mid-1920s to 1953), millions of people living in Soviet territory were exiled to hard labor or political prison camps, thus providing a huge pool of cheap labor for building major projects throughout the vast Soviet territory, especially in sparsely populated regions such as Kazakhstan, Tajikistan and Turkmenistan. An estimated 300,000 Azerbaijanis were among these deportees; 100,000 of them were sent to Kazakhstan. Of these, approximately 30,000 exiles came from the Nakhchivan region [pronounced NAHKH-chi-vahn]-that non-contiguous region, separated from western Azerbaijan by a narrow strip of Armenian territory. Documents indicate that during the 10-day period between August 5-15, 1937, there were 1,957 people in Nakhchivan arrested and exiled. Murtuz and his family, who lived in the village of Nus-Nus in the Ordubad region, were among those unfortunate victims. It was 10 years later (1947) before Murtuz succeeded in finding a way to leave the camp and return to his native Nakhchivan. He survived, his grandfather and many others didn't. Over the years that passed, he felt compelled to tell his story and wrote his memoirs in a book entitled, "Memory of Blood" [Qan Yaddashi. Baku: Yazichi Press, 1991, 208 pages. ISBN: 5-560-00693-9]. The following excerpt reflects his thoughts in 1988 as he looked back upon the significance of Stalin's death in 1953 (pages 197-200). In March 1953, many rumors were circulating about Stalin not being well. The newspaper Pravda wrote something about it, and then a day or two later, the radio and newspapers announced that Stalin had died (On March 1, 1953, after an all-night dinner with interior minister Lavrenty Beria and future premiers Georgi Malenkov, Nikolai Bulganin and Nikita Khrushchev, Stalin collapsed in his room, having probably suffered a stroke that paralyzed the right side of his body. Although his guards thought it odd that he did not rise at his usual time the next day, they were under orders not to disturb him so his body was not discovered until that evening. Four days later, on March 5, 1953, he died. He was 74. An enormous state funeral was held in Moscow on March 9. Officially, the cause of death was listed as a cerebral hemorrhage though it is said that Beria claimed to have poisoned him. Stalin's body was preserved in Lenin's Mausoleum until October 31, 1961 when he was removed to the row of graves behind the mausoleum - Wikipedia, April 20, 2006). 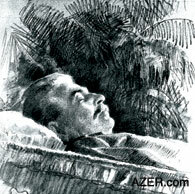 Left: "Joseph Stalin in Coffin" by A. N. Yar-Kravchenko. A Day of Mourning was declared throughout the Soviet Union. Flags were lowered. At every institution, there were honorary guards assigned to stand beside the portraits of Stalin. In our office, I was among those given this "honorary duty" - my colleague Gasim and I. Many people were genuinely weeping, while others only pretended to be. Some were sure that the world would come to an end. Everybody was wondering what would happen to us without Stalin. I can't remember what my particular feelings were that day, but after the funeral ceremony, Gasim and I took a walk in the city park next to our institute. "Stalin's death will bring many changes in the country," he told me. We were sure that this day would leave its mark on our destiny. The tyrant was gone. Nature itself had brought an end to his existence. Nature had lost its patience and snuffed out the life of this individual whom the people, themselves, were not able to get rid of. Nature is the Earth, which just happens to be one-third water. And water doesn't tolerate filth. Nature had lost its patience and made its demands at the precise moment when people were so helpless. Left: Delegation of the 18th Congress of Supreme Communist Party, the Kremlin, Moscow, 1937. 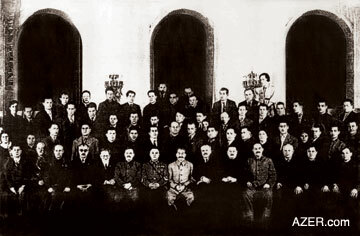 Stalin is seated in the center on the first row in the light-colored suit. Mir Jafar Baghirov, First Secretary of the Communist Party in Azerbaijan and "Stalin's right hand man" in Azerbaijan is seated on first row, fourth from the left (glasses). Mikhail Ivanovich Kalinin (1875-1946) is seated next to him (with beard). Kalinin became the President of the Presidium of the Supreme Soviet, a position he held until 1946. Years have passed. History is the judge of everything. People have since discovered what a tyrant Stalin was. They have begun to understand the extent of the crimes that he committed. In an article published in Pravda on March 30, 1989, he was described as having been a secret agent of the Czar's government. And now these days , they are writing that Stalin was a schizophrenic. They sometimes even compare him with Herod (King of the Jews), Caligula and Nero (Roman emperors), Ivan the Terrible (Russia), or Hitler (Germany). How could such a sick person be in charge of such a huge country? The Soviet people have finally become conscious of the real nature and character of their forefathers. They have come to understand what trouble this tyrant had done to them-this forefather whom they used to believe in. So many innocent people of the Motherland were victimized by his policy. Will history ever forget the wounds inflicted by his axe that were carried out against Azerbaijan's culture in the 1930s? It was so violent. So many intellectuals were killed. So many valuable manuscripts, so many cultural archives were destroyed. Left: Joseph Stalin and Vladimir Lenin in March 1919. Rumors have it that even one of the women who worked in the NKVD (via Russian, Narodniy Komissariat Vnutrennikh Del: People's Commissariat for Internal Affairs - This was a government department, which handled a number of the Soviet Union's affairs of state but was notorious for their arrests, imprisonments, exiles and executions. It was the forerunner of the KGB, the secret police agency of the Soviet Union) canteen used to sell gutab (Azerbaijani traditional cuisine consisting of a crepe thinly layered with either minced meat, white cheese, spinach or pumpkin) that she had wrapped up in some of the original papers on which folklorist Salman Mumtaz (Azerbaijani folklorist [1884 and died either in 1941 (Azerbaijan Encyclopedia), 1937 (Writers' Encyclopedia) or 1938 (Writer's Union). He was arrested during Stalin's purges and died in exile. Unfortunately, the reference books do not even know the exact date of his death) had painstakingly collected and documented ethnographic material. Even today it's difficult to think back on those bloody pages of history. In 1937-38 they were executing people in a forest outside of Minsk (the capital city of Belarus) Later when mushrooms began to sprout there, rumors spread that the mushrooms were reddish in color and people refused to pick them. They would question what the origin of those mushrooms was and pass on by. So much blood was shed during those years in Azerbaijan, too-perhaps, more blood than rain. Who knows? Maybe even such mushrooms started to grow here as well. It wasn't long after Stalin's death that they started to reveal some of his criminal activities (Khruschev's "Secret Speech". One of the most devastating blows to Stalin's reputation was the "Secret Speech" that Nikita Khrushchev (1894-1971) as Party Secretary made at the 20th Congress of the Communist Part of the Soviet Union in February 1956. Left: Active partners in the Caucasus: Anastas Mikoyan, Joseph Stalin and Grogoriy Ordzhnokidze, Tiflis (now Tbilisi), 1925. During the morning's closed session of the last day (February 26), Khrushchev took the opportunity to give a stinging rebuke of the policies of Stalin, his late predecessor. Khrushchev denounced Stalin's cult of personality, and Stalin's apparent support of the concept of individuality. He went on to denounce a list of crimes committed by Stalin's supporters, many of which had previously been denied by the Soviet Union. The speech shocked the delegates to the Congress, as it flew in the face of years of Soviet propaganda, which had claimed that Stalin was a wise, peaceful, and fair leader. After long deliberations, in a month the speech was reported to the general public, but the full text was published only in 1989 - Wikipedia, April 13, 2006). But still, it was a long time before anyone ever mentioned the names of his closest associates. His colleagues such as Molotov (Vyacheslav Mikhailovich Molotov (1890-1986) was a Soviet politician and diplomat and a leading figure in the Soviet government from the 1920s, when he rose to power as a protégé of Joseph Stalin. He became Chairman of the Council of People's Commissars, the equivalent of a prime minister, in December 1930. Molotov carried out Stalin's line of using maximum force to crush the peasant resistance to collectivization, including the deportation of millions of kulaks, who were peasants with property, to labor camps, where most of them died. In 1939 he became the Foreign Minister. He was dismissed from the office by Nikita Khrushchev in 1956 [Wikipedia: April 16, 2006]), Malenkov (Georgy Maximilianovich Malenkov (1902-1988) was a Soviet politician and Communist Party leader, and a close collaborator of Joseph Stalin. He briefly became leader of the Soviet Union (March ­ September 1953) after Stalin's death and was Premier of the Soviet Union from 1953 to 1955. Left: Yalta Conference, February 1945. Allied leaders pose in the courtyard of Livadia Palace, Yalta, during the conference. Those seated are (left to right): Prime Minister Winston Churchil (UK), President Franklin D. Roosevelt (USA), and Premier Joseph Stalin (USSR). From Army Signal Corps Collection in the U.S. National Archives. Together with Lavrenty Beria, Malenkov aided Stalin during the purges of the late 1930s [Wikipedia: April 6, 2006]), Kaganovich (Kaganovich (1893-1991), a close associate of Joseph Stalin was considered by some scholars to be one of the worst mass murderers in history because he helped to engineer the 1932-33 famine in Ukraine, in which 7 to 10 million people died. He died at age 97, a few months before the final unraveling of the Soviet Union [Wikipedia: April 13, 2006]) and dozens of others continued their life in peace. In fact, Kaganovich is still alive (Murtuz Sadikhli wrote this article for Kommunist newspaper on January 27, 1989, at which time Kaganovich was still alive. Kaganovich died in 1991, the year that the Soviet Union officially collapsed) (as of January 27, 1989, when I was writing editing this article). The trial of Lavrenty Beria (Lavrenty Pavlovich Beria, Soviet politician and chief of the Soviet security and police apparatus. He was the executor of Joseph Stalin's Great Purge of the 1930s, even though he actually presided only over the closing stages of the purge. After Stalin's death he was removed from office and executed by Stalin's successors) began on December 18, 1953, and continued for five days before the verdict was announced. So many crimes were revealed during the investigation. Left: Example of the "Personality Cult" that was fastered by Stalin. It was also exposed that Beria had contracted syphilis in 1943. His assistants had instructions to kidnap pretty women that they saw on the streets of Moscow and take them to Beria. During the trial, they started to list the names of the women whom Beria had raped, and a representative from Georgia stood up and asked that the list not be read further. He was afraid it might include the names of wives of all the men that held leading positions. The trial of Mir Jafar Baghirov (Mir Jafar Baghirov was Stalin's right hand man in Azerbaijan as Secretary of the Central Committee of Azerbaijan Communist Party. He was dismissed from the office and put on trial after Stalin's death in 1953 and executed) - Beria's assistant in Azerbaijan-followed. If I'm not mistaken, it was in April 12, 1954. The whole nation was anxiously following this trial, waiting for the verdict. Even though Stalin had already died, Stalinism was quite well and alive. We carried those years on our shoulders like a heavy load. The truth is: we are still being crushed under that enormous burden today. When I was studying in my second year at the Institute, I had a course about ancient Slavic language. Our textbooks were old. Strangely, these outdated books aroused a deep interest in religious literature. I used to write down expressions that I liked in my diary. One of those aphorisms was: "Damned when you enter: damned when you leave". Even today these words seem to describe me and others like me. I have never felt independent. I have always felt under pressure. Always. And I have also always felt this pressure weighing upon my nation. "Even though Stalin had already died, Stalinism was quite well and alive. We carried those years on our shoulders like a heavy load. The truth is: we are still being crushed under that enormous burden today." Karl Marx writes that a mistake made by a nation is as unforgivable as one made by a virgin who yields to the first incidental swindler; a nation should never make such a mistake! Years pass, many things are wiped from our memories, but the experiences that happened during those years still make people pause. People write: but you sense that they are still afraid to write the truth. And we need the truth. We desperately need to know the truth about our past. Sadly, the number of those who witnessed those years is diminishing by the day. 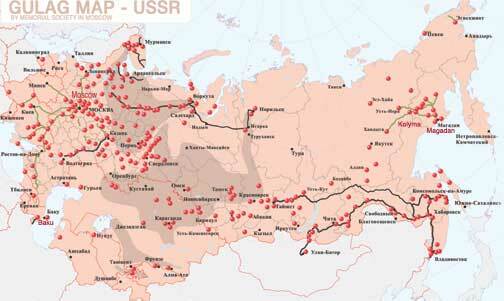 Above: Gulag Map showing where all the prison camps were located during Stalin's era. This map was prepared based on the directory of "System of Corective Labor Camps in the USSR" published by Memorial Association in 1998. All the main camps in the USSR between 1923-1961 are designated. Of course, at certain times, there were fewer camps, but this map reflects a composite of all of the camps. Symbols: (1) Circles: Regional administration (departments) of maps and colonies. (2) Green lines: Roads built by prisoners. (3) Black lines: Railway roads built by prisoners. (4) Gray areas: Territories where exiles were sent in mass. Courtesy: International Memorial Society, Moscow, per Jan Raczynski. For more information about the Gulag and memoirs of prisoners who were repressed, visit: www.memo.ru (Web site in Russian, English and German). Many years ago, I wrote down everything (Elsewhere in his book "Memories of Blood", the author Sadikhli mentions that he started writing his memoirs in the 1950s when he returned from exile to Azerbaijan. It wasn't until 1991-nearly 40 years later - that he was able to publish them) that had happened to me when our family was sent into exile into Kazakhstan in 1937. At that time I would never have imagined that the day would come when my memoirs would be published. But in September 1988, Kommunist newspaper published a selection of my memoirs. Editor's note: Murtuz Sadikhli's book was published in 1991. The first chapter of his book appeared in English in our magazine in 1999. To read about the traumatic journey that the Sadikhli family made from Nakhchivan to Kazakhstan, see Azerbaijan International: "Exile to Kazakhstan: Stalin's Repression of 1937," by Murtuz Sadikhli. AI 7.3 (Autumn 1999). Search at AZER.com. Read other excerpts from "Memory of Blood" in this issue [Qan Yaddashi. Baku: Yazichi Press, 1991, 208 pages. ISBN: 5-560-00693-9].